The work of the PVEA depends primarily on donations from private individuals. We have been fortunate to secure donations from organizations from Yellowstone to Yukon Conservation Initiative, Wilderness Committee, Patagonia, Vancouver Foundation, the Brainerd Foundation and Mountain Equipment Co-op over the years as well. When we apply for funding from organizations such as these, it is important that we show that funding is coming from other sources as well. This is where your help is needed. You may wish to make a financial contribution or you may wish to purchase a painting or cards from local artist Cindy Vincent (scroll down this page), the proceeds of which are being generously donated to the PVEA. E-transfer donations: Please make transfers to PVEA director, Danielle Layman at dlayman1960@gmail.com and send her an email with the password. Online donations: Donations of any amount are sincerely appreciated – small donations definitely make a difference and add up; however, if you are able to donate $100 or more and wish to receive a tax receipt, you can make a donation to us via Yellowstone to Yukon Conservation Initiative (Y2Y). Online donations in Canadian funds through Y2Y for PVEA can be made here. Please be sure to note in the window at the bottom of the online form that the donation is for ‘PVEA’s work on the Site C campaign’. Note: If you would like to make alternative arrangements or have any questions, please contact us at peacevalleyenv@gmail.com or contact our president, Ruth Ann Darnall at 250-785-2105. 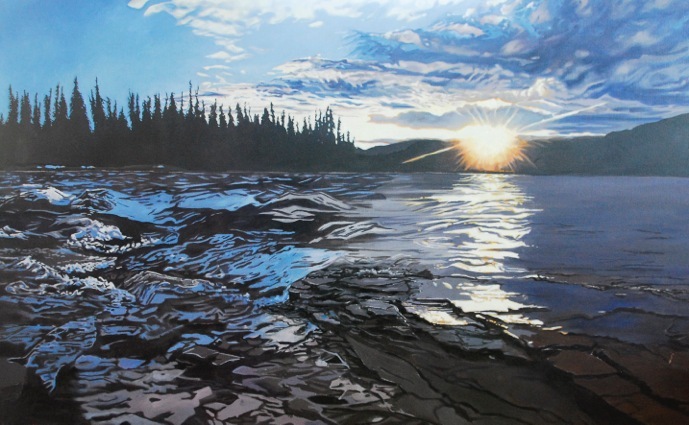 The original 4’x6′ print is presently on display at the Calvin Kruk Centre for the Arts in Dawson Creek, BC and is available to be purchased for $13,500.00. Donations to help support our campaign to Protect the Peace are gratefully received.